A small bungalow was transformed into an impressive house. 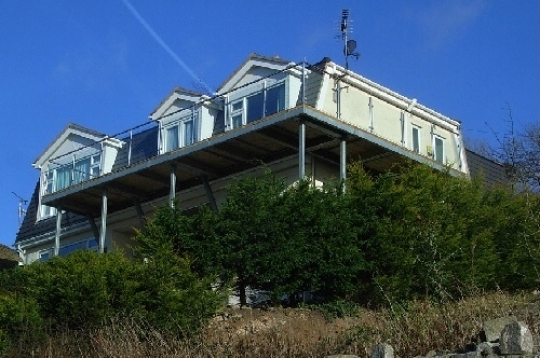 The house, which has magnificent views over the North Wales coast was extended by the addition of a second storey. The new storey was timber framed and constructed by a company in Scotland. The structure was craned into place in a day and the structure made watertight in three days. As with all the extensions, alterations and new dwellings shown here, Chris Parry designed the scheme and completed the architectural drawings and made the planning and building regulation applications on behalf of our clients.